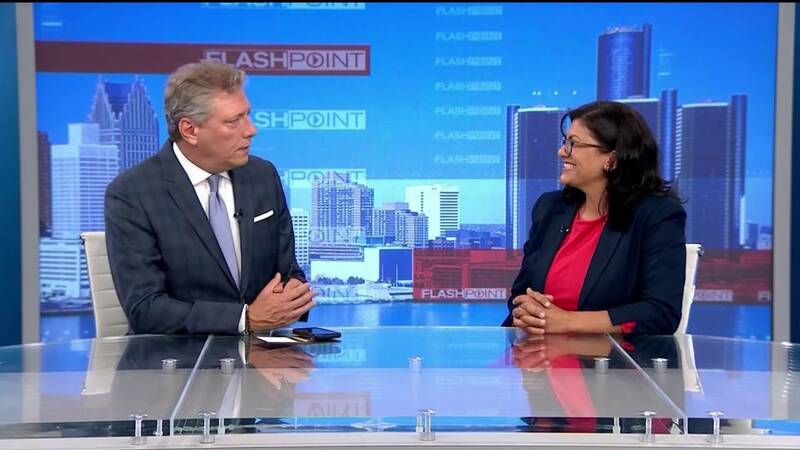 DETROIT - On Sunday, presumptive soon-to-be Democratic Rep. Rashida Tlaib sat down with WDIV-Local 4 Flashpoint host Devin Scillian to discuss her recent election victory, what she wants to accomplish, and the significance of her identity. Tlaib won Michigan’s 13th District Democratic primary race to take over John Conyers Jr.’s former U.S. House seat in the upcoming 2019-2021 term. Because no Republicans are running in the 13th District, Tlaib is all but guaranteed to become the first Muslim woman ever elected to Congress. She did not, however, win the concurrent special election to finish out Conyers’ current term, a separate election that occurred because the long-serving congressman resigned late last year amid sexual harassment allegations. Detroit City Council President Brenda Jones won that election and will represent the 13th District for only two months at the end of this year before passing the baton to Tlaib. A daughter of Palestinian immigrants and single mother to two boys, Tlaib was a practicing attorney and served in the Michigan legislature for six years. She supports progressive policies like Medicare for all, a $15 minimum wage and abolishing ICE (Immigration and Customs Enforcement). Tlaib’s historic victory is drawing national media attention, but this is not the first time she has caught a glimpse of the spotlight. During then-presidential candidate Donald Trump’s 2016 speech to the Detroit Economic Club, Tlaib was ejected from the event after interrupting Trump’s speech. Her passionate political vision and sense of social justice are largely inspired by her Palestinian heritage. Checkpoints around her relatives’ homes near Ramallah in the West Bank make it difficult for residents to access basic necessities like education and health care. During her Flashpoint interview, Devin Scillian brought up the fact that Tlaib will be representing one of the poorest congressional districts in the country and asked what she aims to deliver for the people there. Tlaib says her foremost concern is the everyday issues that face the people of the 13th District. She plans to spend as much time as possible in Michigan, rather than Washington, so she can remain accessible to her constituents. There are certainly those who have espoused vitriolic, even hateful, ideas about Tlaib and her Muslim faith in the wake of her primary victory. But she’s experienced that before in the state legislature and is more determined than ever to respond to words with decisive action. “I feel like I [profess] my faith, Islam, in such a profound, powerful way through public service,” she told Scillian. Watch Flashpoint hosted by Devin Scillian Sundays at 10:00 am ET on Local 4.